Hoi An always draws visitors’ attention by beautiful lanterns along downtown streets and the locals’ sincerity. 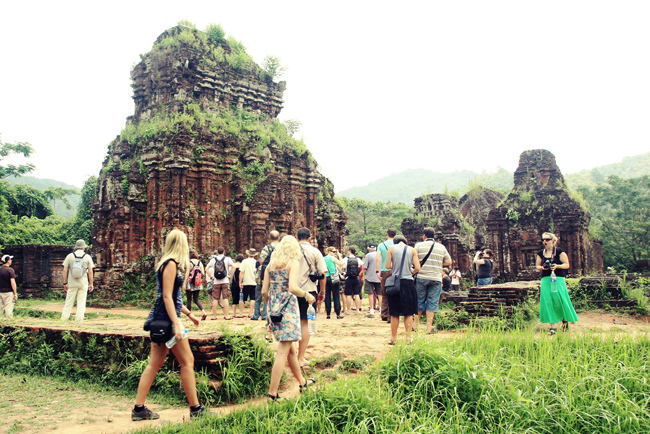 In addition to going for a stroll around Hoi An Ancient Town or unwinding at one of the stunning beaches, contemplating charming red temples and monuments in My Son Sanctuary in the sunset surely leaves you flabbergasted. 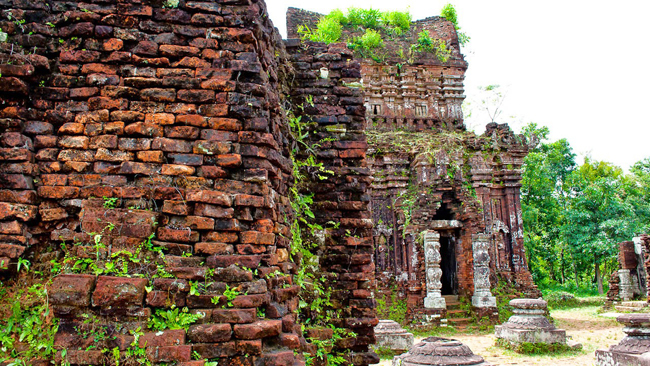 Located in My Son Village, Duy Tan Commune, Duy Xuyen District, Quang Nam Province, the sanctuary is about 69 kilometers south-west of Da Nang city. In general, My Son is known as the Kingdom of Cham people from the 4th to 13th century. In the 19th century, it was then annexed to the S-shaped country. After the total disappearance of Champ dynasty, the sanctuary was sunk into oblivion for a long time until 1885. 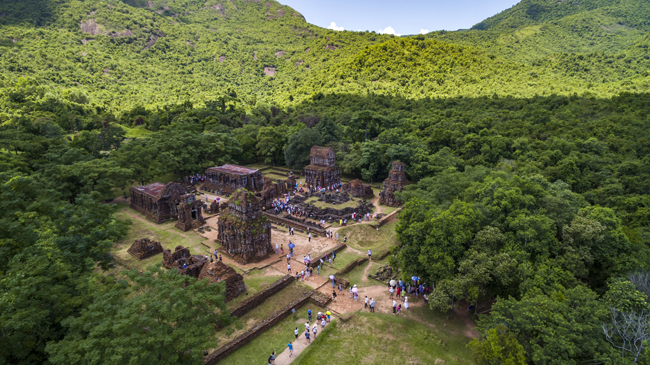 Today, this place has attracted a number of tourists every year, since it stands out as the unique Hinduism relic in Vietnam. Actually, this sanctuary isn’t quite extraordinary, in comparison with the iconic and grand complex of Angkor temples. However, these monuments still have their own charm. My Son was even included in a UNESCO World Heritage Site in 1999, thanks to its historical and cultural significance. The complex contains about 8 groups of temples and 70 prominent monuments. Each group consists of kalan (the main sanctuary) surrounded by towers and tombs. According to many researchers, My Son sanctuary’s architecture was strongly influenced by Malaysian, Arabian, Indonesian, and Indian model. Among them, Indian culture was particularly recognizable in stone sculptures with having the shape of goddesses. Interestingly, it’s also the wonderful convergence of different ancient styles, which make the complex special and worth a visit. All of the towers here were built from both red bricks and sandstone. But, the brick making and construction are still now wrapped in a shroud of mystery among archeologists and tourists. Of course, this heavily depends on when you visit. However, if you are lucky, it is quite possible to watch several dance and music performances at My Son Sanctuary. The locals dressed in unique costumes are happily willing to sing songs with traditional instrumental accompaniment. Remember that such performances are usually held at one of the temple groups or at the main information building. Hence, make sure to get informed before checking in. These are known as interesting and cultural shows. Since the first group in My Son is best preserved, you should spend much time here. It is also a great idea to look into the 2 buildings that have a small museum inside. Other groups are also worth checking out because these help you understand more what the bombings did. Have unforgettable memories by taking pictures around the sanctuary. My Son Sanctuary is open every day for tourists to visit, from 6.30 AM to 5 PM. The entrance ticket is different, depending on whether you are a domestic or international traveler. Such ticket covers the cost of transportation to the relics as well as the fee for music performance. You are advised to check in there in the early morning (about 5 AM). That’s because the complex often welcomes hundreds of visitors every day. Further, it is also the best time to enjoy the peaceful sunrise, have a fascinating view and feel less rushed. Or, another way to avoid the crowd and hot weather is to plan to arrive in the afternoon (about 2 PM) when other groups of visitors mostly finish their trip. See our tour to My Son Sanctuary here or here. Don’t forget to bring sun glasses, hat, and sun cream to protect your skin from the sunlight as well as take bottles of water with you to avoid feeling thirsty. Ensure to explore the sanctuary as much as possible during the time limitation so that you’ll not regret something afterward!